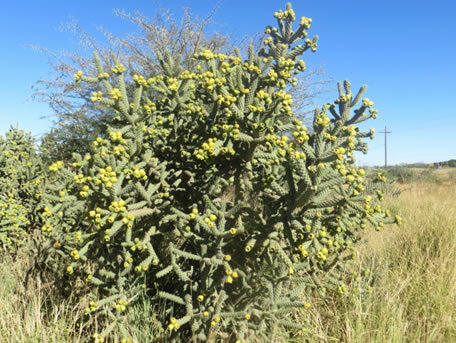 Plant features: Cylindropuntia spinosior is a succulent, evergreen multiple branched plant. It forms dense stands covered with spines. The plant has cladodes that are 5 to 23 cm long and 1.3 to 3.5 cm wide which are firmly attached to the stem. Cane cholla grows between the height of 0.4 and 1.2 meters. The flowers may be purple, reddish, orange-brown, yellowish or white and appear from spring to early summer. 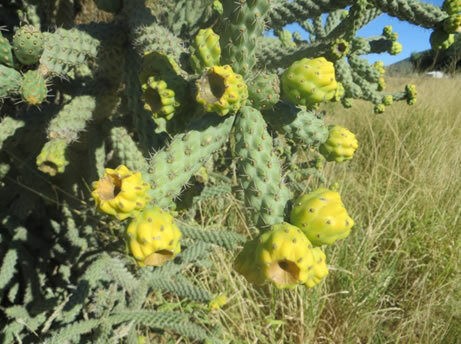 The fruits of Cane cholla are yellow, fleshy, tuberculate, and spineless. Why it is a problem: The plant is from Arizona and New Mexico in the United States and it has been reported invasive in these countries. A segment of this species is able to form a new plant once detached form the parent plant, therefore it can grow fast and take over rangelands, roadsides, disturbed habitats, displace native species, and reduce forage for livestock and wildlife. The dense stands of the plant restrict livestock movement. Records of Cane Cholla in South Africa: The species has been recorded by South African National Biodiversity Institute, Biological Invasions Directorate (SANBI’S BID) staff at Beaufort West in a dump site and Graaff’reinet in an open space. If you see these plant species, please report them to the SANBI’S BID. Please if possible provide us with a locality, pictures, and your contact details. The South African National Biodiversity Institute (SANBI) is mandated to conserve South Africa’s rich biodiversity. Its Directorate of Biological Invasion (BID) aims to reduce the threat of biological invasions through detection, post-border risk assessment and management planning.